 What Is the Aim of Our Work? Thank you, dear Anna, for taking such amazing pictures!  Dignity: A Multidimensional View Book Launch, a video created by Francisco Cardosos Gomes de Matos for the occasion of the global launch of his book Dignity - A Multidimensional View published in Dignity Press in 2013. Francisco Gomes de Matos is the President of the Associacao Brasil America (ABA) Board, and in this video he addresses this workshop as one of the locations for the global launch of his book on dignity. The video was created at the Associacao Brasil America (ABA) in Recife, Brazil, and published on 29th November 2013. 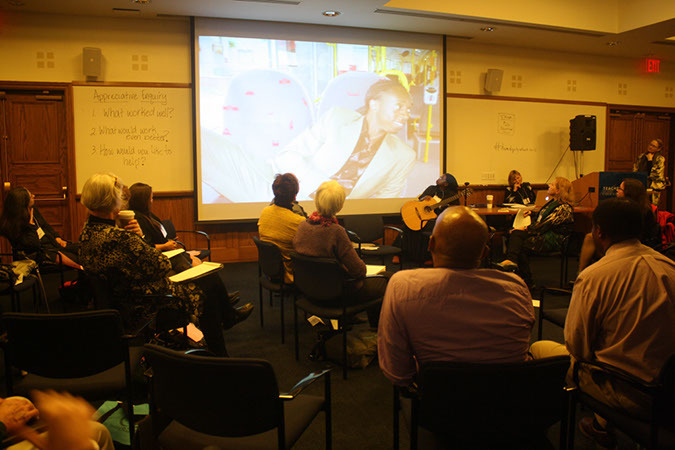  Caroline Amollo: Introduction to Research on Dignity, a video in which Caroline greets the participants of the workshop, among them her academic adviser Inga Bostad. Carol is the first PhD candidate of the World Dignity University initiative, in partnership with the University of Oslo, Norway. This video was recorded on 2nd December in Nairobi, Kenya, by Nicole Dorie. • Refugee Women, Human Rights and Belonging: Educating for Dignity, by Maggie O'Neill on December 5, 2013, see also Searching for Asylum, produced by Jan Haaken and Maggie O'Neill, this video documents a participant action research project carried out with a group of women asylum seekers in the UK, published on 21 Jul 2013. Thank you so much, dear Courtney, Anna (McDonald), and Claudia, for stepping up and working so hard to make all those videos, even though you had never done it before! Amazing! Morton Deutsch is the honorary convener of our workshops. He is the founder of the Morton Deutsch International Center for Cooperation and Conflict Resolution (ICCCR), our host at Teachers College, Columbia University, New York City. In 2009, we celebrated his influential, important, and eminent life and life-work with the first life-time award of the HumanDHS network. Please click on the picture above to see it larger. 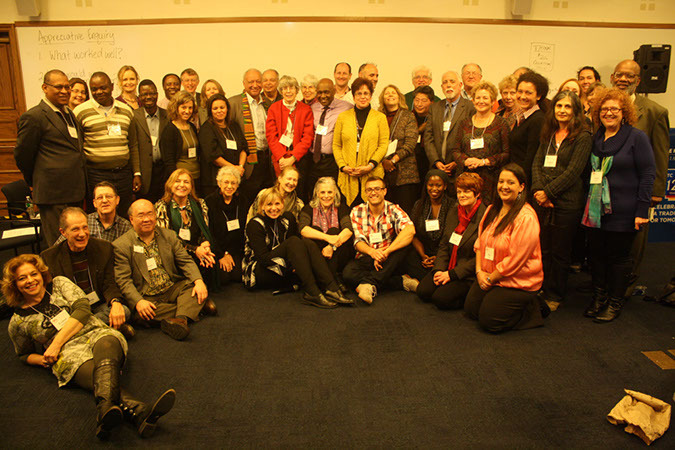 Pictures of all of us on Day One of the workshop, Thursday, December 5, 2013. • Please click on the picture above or here to see all the 231 photos of Day One that dear Anna Strout made for us (except the photos with the name tags). Dignilogue 1 on Day One of our workshop, Thursday, December 5, 2013. Phil Brown led the Moving into Action session on Day One of our workshop, Thursday, December 5, 2013. Public Event on Day One of our workshop, titled, "Beyond Humiliation and Violence: The Urgency of Educating for Dignity and Peace," Thursday, December 5, 2013. • Please click on the picture above or here to see all of the 89 photos of the Public Event that dear Anna Strout made for us.  In the spirit of our motto of Unity in Diversity, the evening began with Fred Ellis and his children, singing songs from many cultural backgrounds. 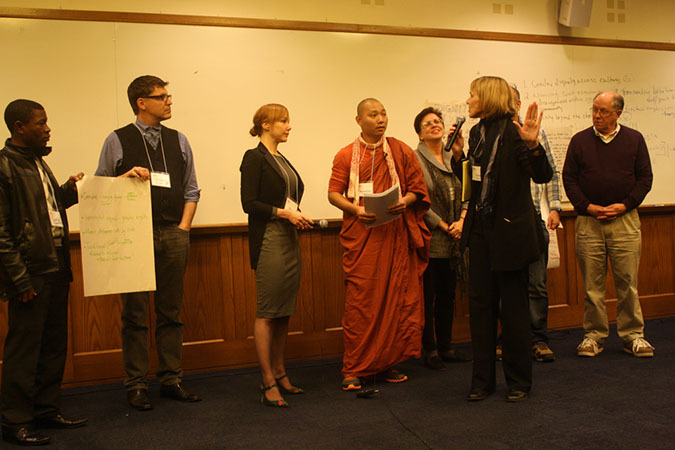 • Linda Hartling opened the Public Event of the Workshop on Transforming Humiliation.  Refugee Women, Human Rights and Belonging: Educating for Dignity, by Maggie O'Neill. 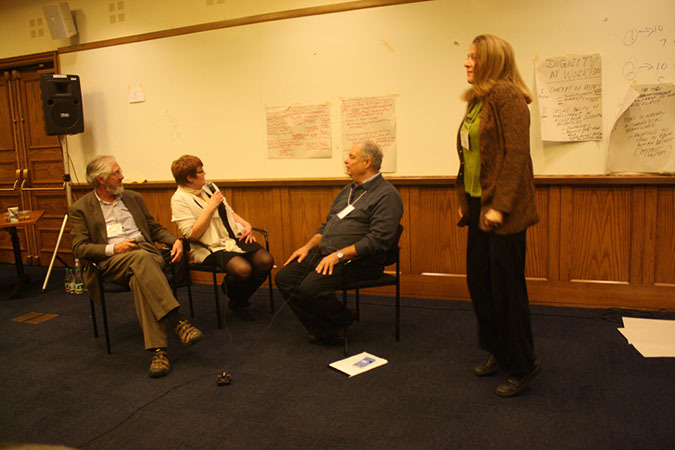 Pictures of all of us on Day Two of our workshop, Friday, December 6, 2013. • Please click on the picture above or here to see all of the 247 photos of Day Two that dear Anna Strout made for us. Dignilogue 2 on Day Two of our workshop, Friday, December 6, 2013. Michael Britton gave the Don Klein Memorial Lecture on Day Two of our workshop, Friday, December 6, 2013. Michael uses Don's metaphor of a scrim, a transparent stage curtain, where one believes that what one sees is reality only as long as the light shines on it in a certain way: see Don's explanation. • Please click on the picture at the bottom or here to see all of the 247 photos of Day Two that dear Anna Strout made for us. Recognitions, Remembrances, and Awards on Friday, December 6, 2013, Day Two of the 2013 Workshop of Humiliation and Violent Conflict! Dignilogue 3 on Day Two of our workshop, Friday, December 6, 2013. • Please click on the pictures above or here to see all the photos of Day Two. Closing our workshop on Friday, December 6, 2013. December 4, 2013, Board meeting with our dear Morton Deutsch. • Ulrich Spalthoff: Summary of my activities 2013, HumanDHS board meeting December 4, 2013. Please click on the picture above or here to see more photos. (representing the Twenty-Second Annual HumanDHS Conference)! 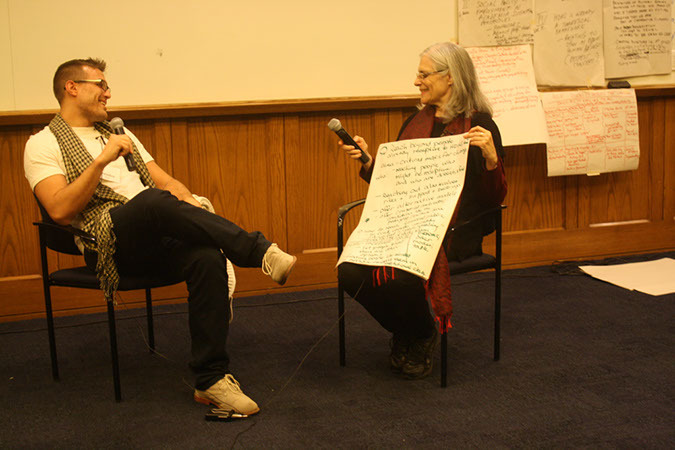 May Linda and I express our sincere gratitude and appreciation to all of you who co-created our 2013 Workshop on Transforming Humiliation and Violent Conflict representing the Twenty-Second Annual HumanDHS Conference! You ALL contributed so that our workshop became a unique and exiting experience! We would like to thank Morton Deutsch, our honorary convener, Peter T. Coleman, Claudia E. Cohen, Founder, Director, and Associate Director of the Morton Deutsch International Center for Cooperation and Conflict Resolution (ICCCR) at Columbia University and their wonderful team, together with our other generous host Jean-Marie Guéhenno, who is the successor of Aldo Civico, and Andrea Bartoli as Director of the Center for International Conflict Resolution (CICR), and member of the Columbia University Conflict Resolution Network (CU-CRN), now AC4. We also wish to give special thanks to Beth Fisher-Yoshida, Academic Director of the Master of Science Program in Negotiation and Conflict Resolution at the School of Continuing Education at Columbia University. We would furthermore like to express special thanks to Philip Brown and Michael Britton, and to Rick Slaven, Tonya Hammer, Dee Sloan, as well as to and Anna Strout, Anna McDonald, Courtney Eye Furlong, Claudia Maffettone, and Brandon Scott, who so wonderfully helped to keep our workshop in shape, and documented the entire conference. 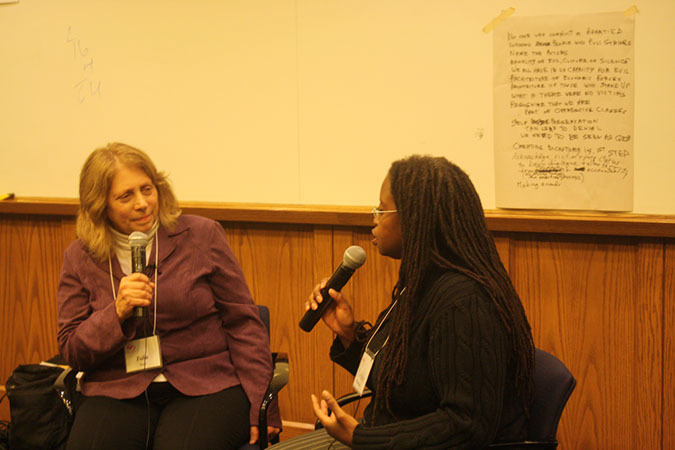 Tonya Hammer kindly accepted our invitation in 2010 to lead the organizing team of this workshop. Rick Slaven did not just take care of our finances, he also always creates a unique atmosphere of humor, modeling our motto of "taking ourselves lightly, even when we take our work seriously." Thank you, dear friends! We are overwhelmed by the generous support that you extended and would like to express our deep gratitude! As always, our very special thanks go to Linda M. Hartling for setting the frame of appreciative inquiry in and Donald Klein's spirit. Our warmest thanks go furthermore to our "moderator of moderators," Philip Brown, who moderated the first Dignilogue together with Maggie O'Neill, Beth Fisher-Yoshida & Roberta Kosberg were the moderators for the second Dignilogue, and David Yamada & Stephanie Heuer for the third! May we end by thanking the contributors to our Public Event on the afternoon of Thursday, December 6, for their wonderful inspiration! First came Fred Ellis with his pupils, then came Inga Bostad and Maggie O'Neill, who shared their thoughts and experiences on dignity and education with us, and George Wolfe and Chris Layer rounded up the evening with their amazing saxophone, flute, and Irish pipe play! THANK YOU ALL for your amazing gifts! Finally, Michael Britton moved us all again deeply on Friday morning with his Don Klein Memorial Lecture that he gives in the place of Don's originally planned lecture titled The Humiliation Dynamic: Looking Back... Looking Forward. Don showed us how to live in awe and wonderment. We will always need your wisdom, dear Don! Inga Bostad received the HumanDHS Beacon of Dignity Award on Thursday, December 5, 2013, during the Public Event of our workshop! Let us celebrate her and her extraordinary work, and express our gratitude to her for his invaluable continuous support to our World Dignity University initiative! Furthermore, we honored Abou Bakar Johnson Bakundukize with our 2013 HumanDHS Lifetime Achievement Award. His partner and spouse Vidal Ruse spoke to us via video. Please join me in expressing deep gratitude to Linda Hartling. Without her wisdom, love, care, and huge investment of time since 1999, when we met via email, and then, in full intensity, since our first conference in 2003, our network and our conferences would not be there. Please celebrate Linda’s leadership! In November 2008, Linda relinquished her administrative responsibilities at Wellesley College to devote more time in service of HumanDHS and she is our new HumanDHS Director! 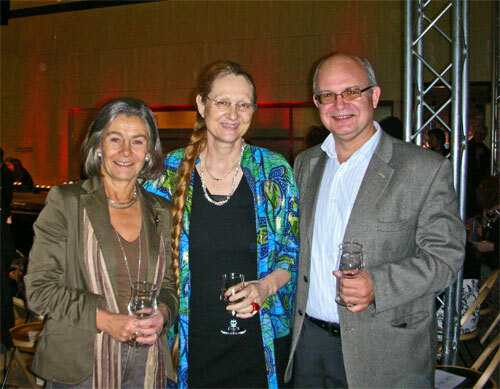 (Evelin remains the HumanDHS Founding President). A big welcome to you, dearest Linda! 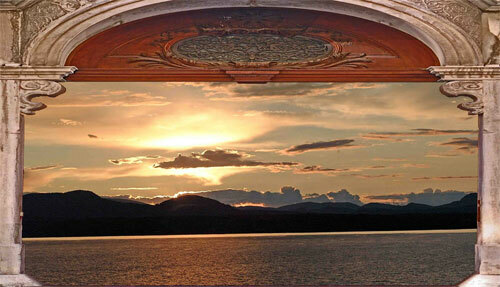 Rick and Linda moved across the North American Continent and found a physical home for the Pacific Rim Branch of HumanDHS and the first HumanDHS Dialogue Home in Portland, Oregon. Everyone is invited to visit! And please send Linda all of your relevant books to be included in the HumanDHS library! Now, we would like to extend a special thanks to those of you who completed the Appreciative Enquiry note cards at the conclusion of the workshop. As Linda explained, this information is important for us as we begin to reflect on what we could do differently next year and in future years. Your willingness to participate in this process is very important for us, as we very much want this workshop to continue to be a collaborative effort. We extend our warm thanks to each of you for being part of this co-creation. Please be reminded that our events differ from traditional conferences where speakers are invited and funded by organizers and audiences pay a registration or entrance fee to listen to the speakers. In other words, usually, organizers gather speakers who "market" their knowledge to an audience. We wish to transcend the separation between speakers and audiences and nurture our gatherings in the spirit of what we call dignilogue (dignity + dialogue). There is no monetary remuneration involved in our events. Participants join the workshop because they wish to share their work, their experiences, and their insights. 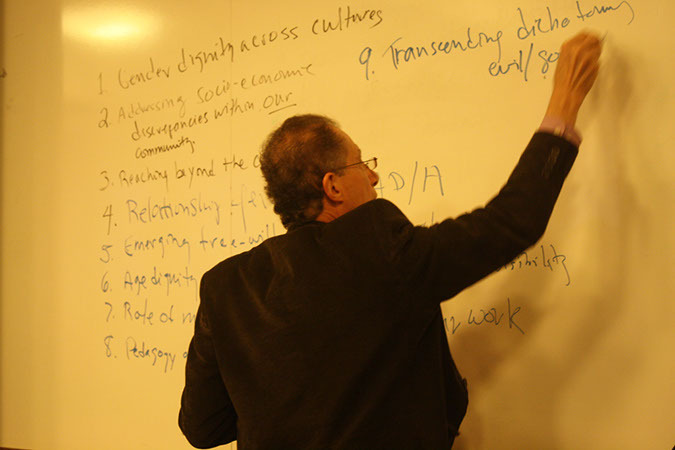 The main point of our work is the nurturing of a global dignity community. Our events are a labor of love, as is everything else connected with our network. None of us is being paid, including the organizers, there is no fundraising and no profit involved. We share the minimal overhead in a dignity economy approach by everybody contributing according to ability. We could have had many more participants and unfortunately had to say "no" to many of you who wrote to us and wished to participate. We would like to express our regret to all of you who did not have the opportunity to participate. We will try to broaden our activities in the future. Your help is welcome! Please bear with us and give us your support so that we can grow in constructive ways! Our workshops are upon invitation. You are warmly welcome to contact us if you wish to join us next year in this workshop (December 4-5, 2014). Please do this as early as you can, particularly if you feel that you would like to share your experience and work in one of our dignilogue round tables. The round tables are often filled up by July. You can always participate as a supporter of the Dignilogue round tables or as observer. Also in that capacity you can actively participate, for example, by using the two empty chairs in each round table. We usually recommend newcomers to be with us as supporters and observers first, so that they can familiarize themselves with the format, and envision to be part of a round table in future workshops. A very very warm thank-you to you all! Evelin & Linda, on behalf of our entire network. PS: We would need your permission to place pictures and videos on our website. Please let us know if you would not wish to be included, thank you very much! Announcement of our Latest News! What Is the Aim of Our Work? Please read more in newsletter12.  avoiding duplication of the achievements of others who have already worked with similar issues. Rather than competing with existing institutions, our goal is to join hands in the spirit of mutual respect and equality in dignity to create something much more powerful than what we would accomplish if we worked independently. We already have connections with highly regarded academic institutions through our network of scholars on our Global Advisory Board.  respecting unity in diversity: The views expressed on this website, as in any of the HumanDHS publications, do not represent any official HumanDHS position. All HumanDHS publications present the views and research findings of the individual researchers, educators, and authors, with the aim of promoting the development of ideas and discussion about major concerns of human dignity and humiliation studies and related fields.  diverse online courses/seminars/talks/workshops will be shaped by the members of our various teams and boards, particularly our Education Team members, with their diverse expertise and approaches, supplemented with face-to-face gatherings, for example, at our annual meetings. Please see more on www.humiliationstudies.org/education/education.php, and the Pdf file of the description of the World Dignity University initiative. Our overall aim is to invite all educators of this world who share our values to contribute with topics related to dignity, for lectures, courses, seminars, workshops. Students are invited to contribute with their ideas and wishes for topics. Learning is reciprocal. A student can also teach and an educator can also learn, and we invite everybody to be both. We envisage building two data bases of video clips, one collection of topics on offer, and another for topics sought. Our overall aim is to nurture our World Dignity University initiative as a growth process, as an invitation into a movement that emerges, thus manifesting our core principle of unity in diversity also through the way we go about and the structure of our work. Sometimes, we also use the metaphor of a tree. In other words, we would be extremely happy if all of you who read these sentences now, and who share our values, would feel inspired to contribute to the World Dignity University initiative! We would love you to create similar video dialogues as you see here. It would be wonderful to have your reflections on why you think dignity is important and what you could contribute to a World Dignity University! 1. Let us assume you wish to contribute with a topic to the WDU initiative, and you present it in a video clip. 2. Let us assume that ten students from all over the world click on your video, indicating that they find your theme interesting. 3. This motivates you to give a lecture of one or two hours, having it video-taped, so that we can place it on the World Dignity University website. 4. The next step would be that you develop a seminar/course/workshop on your theme. You could help your students to gather for an initial face-to-face meeting, followed by one or two semesters of online teaching, and a final face-to-face meeting (you might want to help your students find the funding for their travels, or, if this is not possible, those who cannot afford the travel cost could participate via video). In that way, unity in diversity will be expressed through manifold themes and manifold ways of teaching and learning. 5. For those students who wish to work for a degree, please see Ragnhild Nilsen's experience. Dear participant in our workshop! You contributed to bringing dignity and love into our workshop, and due to your presence, it was an unforgettable experience! Your contributions spoke to the need to begin with ourselves if we are serious about bringing more dignity into the world. The motto of unity in diversity provides a path toward dignity, and we would therefore like to invite you to send us your reflections in connection with our workshop. We will place them here, just below this paragraph, so that we all can see the diversity of impressions that emerged, and the diversity of ways in which we touched each other. Thank YOU! From Evelin's global point of view, unity in diversity is helpful as a motto to describe how the unity of communal solidarity, or what Evelin calls "big love" in her Gender book, can replace isolated or even hostile division, and how diversity in the context of equal dignity needs to replace oppressive uniformity. Evelin uses the infinity symbol, or the Möbius Strip, or the lying 8, ∞, to make this motto visible, and to show how it can model the form of dialogue that truly manifests the human rights ideal of "every human being is equal in dignity." Throughout her global life journey, Evelin found two cultural realms where each of these cultural traditions can be experienced at their best: In the photos above, Inga Bostad stands for the Norwegian cultural heritage of equality in dignity or likeverd that opens space for diversity, while Doaa Rashed stands for the cultural heritage of collective cohesion in the Nile Delta, a social cohesion that is indispensable when bridges are needed to be constructed to bring unity into diversity (Evelin lived in Cairo from 1984-1991). In what has become a welcomed rite of December, I just spent two days participating in the annual workshop of the Human Dignity and Humiliation Studies (HumanDHS) Network, held at Teachers College of Columbia University in New York. 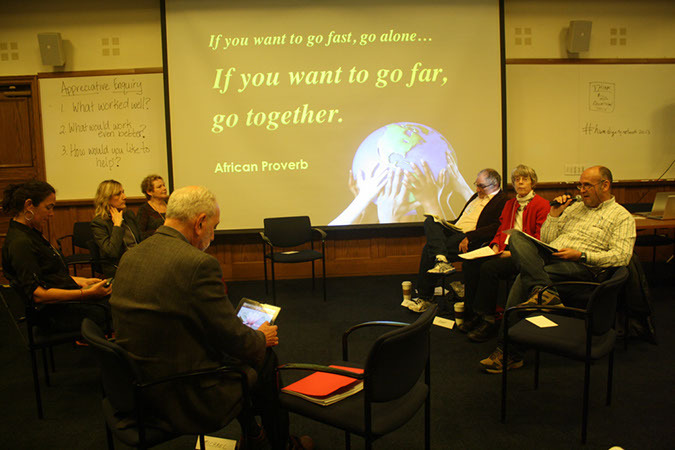 The workshop is a global, transdisciplinary gathering of educators, practitioners, and activists devoted to advancing dignity and ending humiliation in our society. The founding president of HumanDHS is Evelin Lindner, a physician, psychologist, and self-styled global citizen whose life mission is rooted in the displacement of her family during the ravages of the First and Second World Wars. In her remarks to the group, Evelin talked about the need to "embrace the world as our university." She urged that in the face of powerful political and economic forces that operate to advance the interests of the most privileged, we must "build a new culture of global cohesion, global friendship." For me, one of the highlights of the gathering is psychologist Michael Britton's annual address, in which he weaves together individual and societal dynamics that either impede or promote the creation of a more decent world. Michael observed that after a century marked by major wars, severe financial crises, and significant inequalities, we are presented with a traumatized world containing an "immense surround of pain and dysfunction." The opportunity and challenge before us, he noted, is that we're "groping toward a kind of world that none of us has experienced," adding that we must create "learning environments where people sense the emerging future worth working for." The array of topics discussed at the workshop runs a global gamut, from conflict in the Middle East, to human rights and incarceration, to — yes — even workplace bullying. Indeed, the theme of bullying came up on several occasions during the gathering, in addition to my short talk on bullying at work. And, in fact, the director of HumanDHS is Linda Hartling, a psychologist and leading authority on relational-cultural theory whose assessment of workplace cultures is one of the most valuable framing concepts I've encountered toward understanding organizational life. If you'd like to get a deeper sense of the rich variety of people and topics present at this conference, please see the extended agenda, here. I'm going to devote another post or two to this workshop and to the work of HumanDHS, so stay tuned. How do we make human dignity a primary, framing concept for how we look at society and ways to better it? 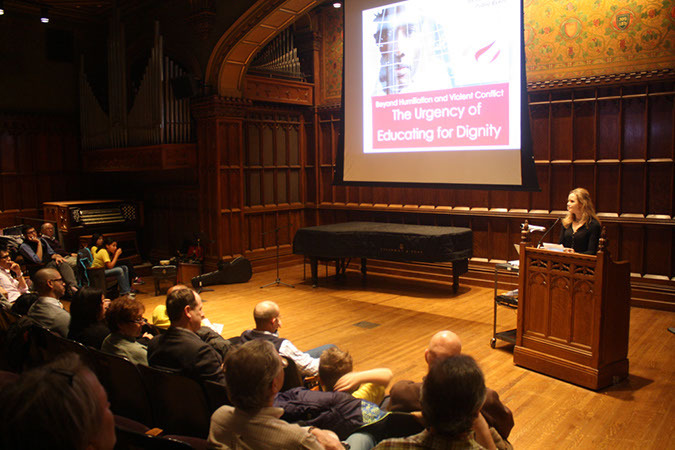 As I reported in my last post, I spent two days last week participating in the annual workshop of the Human Dignity and Humiliation Studies (HumanDHS) Network, held at Teachers College of Columbia University in New York. 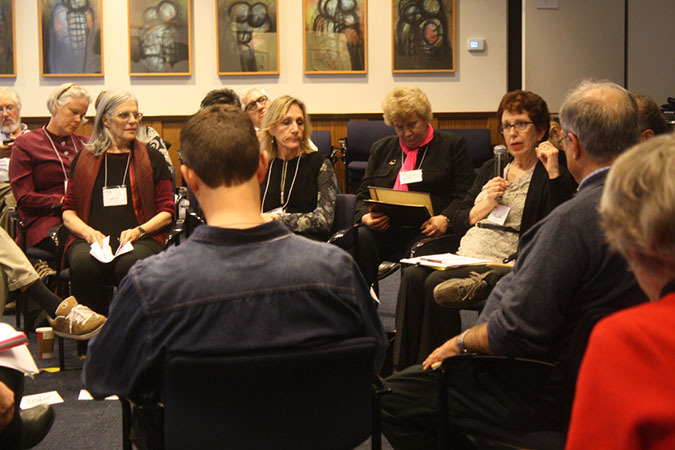 The workshop is a global, transdisciplinary gathering of educators, practitioners, and activists devoted to advancing dignity and ending humiliation in our society. I've been a part of HumanDHS for some five years now, including serving on its global advisory board. At the workshop, one of our small group discussions centered on the question of how to carry the dignity message beyond the choir. In other words, how can we reach others who might be receptive? Politically speaking, there remains strong, powerful pushback against anything that might be construed as a dignity agenda for public policy, especially when it comes to economics, wealth inequality, human rights, and the environment. As I wrote in a 2009 law review article, "Human Dignity and American Employment Law," any "dignitarian" view of the workplace must confront a dominant "markets and management" framework that presumes the superiority of the market economy and unbridled management control. • Limited access — Access to mainstream media is limited. The markets & management, command & control mentality drives the media as well, making it less likely that alternative perspectives will get regular airings. • Nuance and detail — The supposed virtues of the free market and top–down control make for easy, uncomplicated messaging. Arguing the virtues of dignity as a framing societal concept requires a respect for nuance and detail. • Translating our work — Academicians, in particular, can be woefully bad at communicating their work and ideas to the outside, general public. Furthermore, they often find little support for this role in academe, where notions of the independent, public intellectual have largely given way to exploited part-time instructors, narrowly specialized scholars and, on occasion, celebrity professors. • Bridging gaps — Those of us who value the application of research, analysis, and creative thinking to societal problems continually must work on bridging the gaps between scholarship and public education & advocacy. • Getting specific — In more concrete terms, platforms such as blogs, Twitter, Facebook, and independent publishing can provide alternative ways to advance a dignitarian message. Having that presence will also, at least on occasion, attract attention from mainstream media outlets as certain topics expand in the public eye. • Resilience and empathy — We have to be willing to take our lumps. In a more public forum, it's likely that a dignitarian message will attract Internet trolls and others whose purpose is to ridicule and denigrate. But if we stay cocooned, we're not making the world a safer and better place. Resilience and empathy must go hand-in-hand. There's a lot more to be done on this question, and it is very, very relevant to the central challenge of transforming our workplaces. I will continue to explore it in future posts. Reference: Wall Street-Backed Organization Blasts Rising American Populism and Elizabeth Warren: In a noxious Wall Street Journal editorial, Third Way boosters try to strangle the new wave of populism in its crib. How can those who want to advance human dignity claim and use power toward that good end? 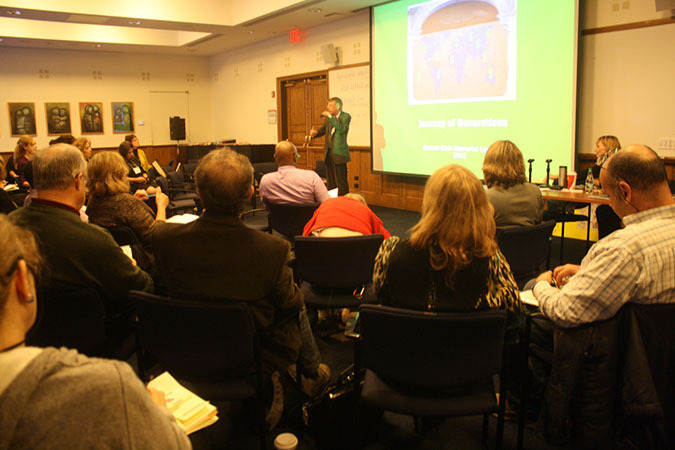 I spent two days last week participating in the annual workshop of the Human Dignity and Humiliation Studies (HumanDHS) Network, held at Teachers College of Columbia University in New York. 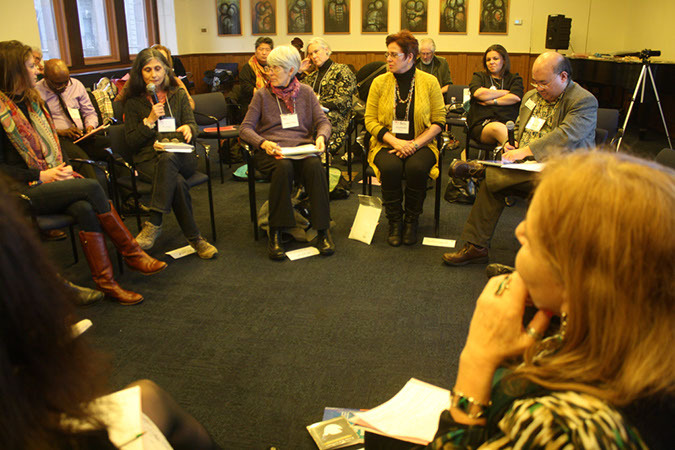 The workshop is a global, transdisciplinary gathering of educators, practitioners, and activists devoted to advancing dignity and ending humiliation in our society. 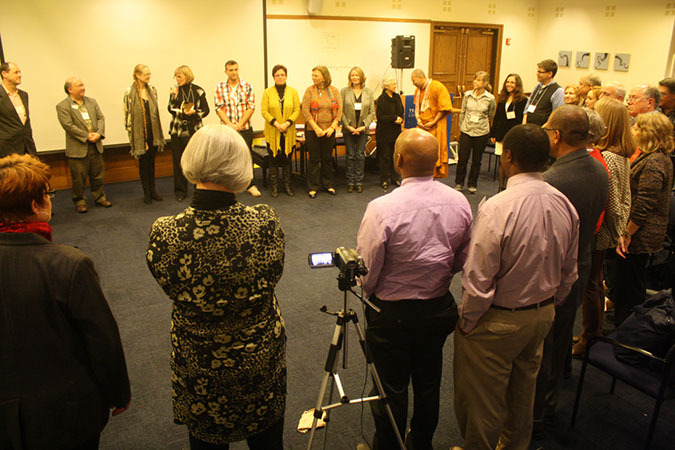 At the end of the workshop, we stood in a circle, and each person shared a closing thought. When it was my turn to speak, I noted that the term "power" was not invoked often during our two days together, and I suggested that we need to summon our personal and collective power to address the societal challenges highlighted so eloquently by the participants. I'd like to elaborate on my remarks here. I submit that those of us who have witnessed excesses of power may be wary or downright fearful of it, and with good reason. All too often, power is exercised by those who use it to hurt others. Consequently, many of us have come to associate power with abuse. To illustrate, I think this apprehension is why some progressives are uncomfortable with the labor movement. Organized labor is about building collective power and exercising it. On occasion it can misuse that power. So, yes, there are trade-offs when even the most valuable social movements and institutions demonstrate their imperfections. However, without a strong labor movement, the prospects of everyday workers are quite perilous. It's no coincidence that here in the U.S., we've witnessed the simultaneous decline of union membership levels and rise of massive wealth inequalities over the past three decades. My larger point is that such ambivalence can cause us to cede our own power to make positive change. Perhaps some feel comfortable with the term "empowered," which is more likely to be invoked at gatherings of social activists. But I think we need to face down the beast. We need to build our individual and collective power, exercise it effectively and judiciously, and keep it in check when we are tempted to use it excessively. I realize that my comments may sound more like a self-help rap than a call for a better world, but I have long believed that artificial dichotomies between individual change and social change cause us to overlook their interrelatedness. Power can be heady stuff, like holding a live wire. Those committed to advancing human dignity should carefully but decisively embrace it and use it. This network is truly remarkable for its variety of talent, deep well of knowledge and shared passion for the basic human right to live in dignity. I honestly stand in amazement at how you all manage to shine your light through such a dark, stormy night of the soul as this experience of being human can often be. We would like to end this newsletter by thanking you again for all the wonderful mutual support. You contributed so generously, therefore let us give our warmest thanks to ALL OF US! We very much look forward to our upcoming two conferences in 2014! Please let us know as early as you can if you would like to join us, particularly if you wish to be part of a Dignilogue in December 2014 in our next Workshop on Transforming Humiliation and Violent Conflict in New York City! Thank you! In the meantime, please be warmly invited to our next HumanDHS conference in Chiang Mai, Thailand, in March 2014!